We’ve all heard it before; the constant complaints of temperature in the workplace. Until now, it has been a problem management, as well as business owners, haven’t had an easy solution for. And when trying to find a solution, does it really solve the problem? Some people are forced to create a temporary fix. Others try to ignore there’s a problem. But one thing remains a fact, complaints don’t seem to go away. An overly heated workplace can leave employees fatigued, irritable, and struggling to concentrate. In contrast, an overly heated workplace can leave employees fatigued, irritable, and struggling to concentrate, according to the U.S. Department of Commerce. Therefore, when the brain is preoccupied with monitoring body temperature, it is safe to say that workplace productivity can suffer. In the 2004 Cornell University study, it was found that workers who struggle to stay warm tend to make more mistakes, which, in turn, can lead to a 10 percent spike in hourly labor costs. This has the potential to be detrimental to a business. 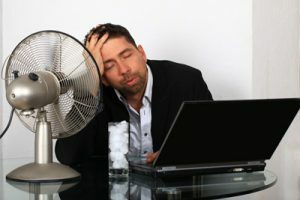 Being “too hot,” or, “too cold” and not finding the right solution can now be a business expense and oversight, in the long haul. Trying to create the optimum working environment isn’t easy. What happens when the battle of the sexes takes place near the thermostat in the workplace? In an article by Lori Corrig, in the Houston Chronicle entitled, “How the Temperature in the Workplace Impacts Productivity,” Lori points out “due to their greater muscle mass, men usually get hot quicker than women. At the same time, women have a greater number of constricted vessels that keeps blood near the skin’s surface. This is partly due to the female body’s biological tendency to pool blood around the core organs, which draws it away from the extremities and leaves women with the constant need to warm up their cold hands and feet.” With that being said, inevitably, there is a clear difference in body temperature between men and women due to these biological factors. It seems as though finding the right balance is crucial. By now, it may not come as much of a surprise that people work most productively when they are in a comfortable environment. The climate of your office can have both a positive and a negative impact on productivity, as well as comfort. By maintaining a comfortable climate in your office, you can increase this productivity. When thinking about in which ways you can accomplish the optimum environment for the office, considering air temperature as well as air humidity and air movement is especially important. Each of these components needs to be adjusted to best suit the working environment. Here at REV HVAC, we make this task easier. 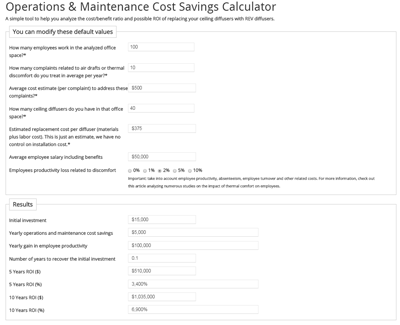 If you go to REV-HVAC.com, we have made a handy ROI calculator that gives you a rough estimate on what kinds of savings a business would obtain if an employee’s productivity was higher due to an improved climate in the workplace (ROI calculator: Return on Investment Calculator for the REV Diffuser in Office Spaces – REV HVAC). Out of the three components, we help you take care of the most difficult, which is air movement. 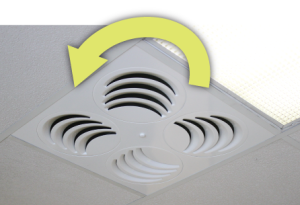 By adjusting the airflow, you’ll gain more control as a facility manager, or a business owner, because REV is the only diffuser that allows for a 360 degree adjustment of the airflow. This gives you the ability to adjust air drafts, improving the temperature in certain areas, as opposed to everywhere at once. Finally, something that makes sense!